Happy Monday dolls! I feel like I've finally recovered from Full Figured Fashion Week. Whew! My feet are beginning to feel like normal, and my body has finally rested enough to make up for the lack of sleep! I had a great time though. In fact, I did a full recap of my week on the SonsiLiving blog so make sure to check that out. 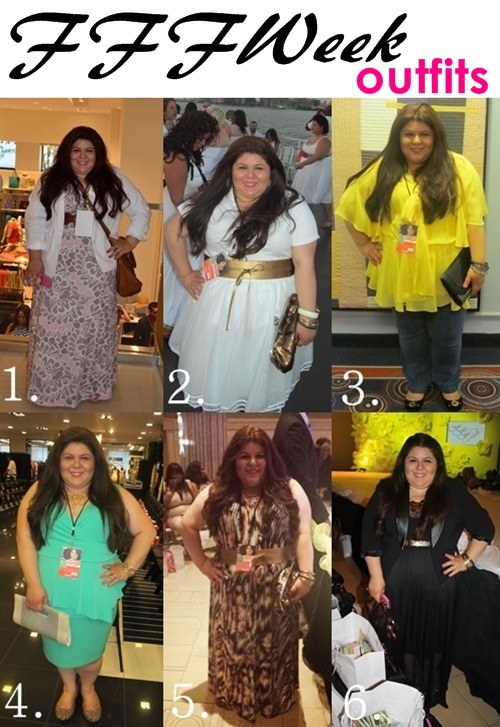 But today, I just want to show you the outfits I wore to each event! Make sure to tell me which one is your fave! 4. Bloomingdale's Runway - I attended the Bloomingdale's fashion show featuring plus size outfits from Michael Kors, Vince Camuto, Calvin Klein, and more. 5. Indie Showcase - This runway show was all about showcasing upcoming indie designers. 6. Retailer Showcase- A runway show put on by the best retailers in the plus size industry. Don't forget to enter my Relax Missy Giveaway! Win a fab pair of foldable on-the-go- flats here! Love the yellow top so much!! all the outfits are fabulous! Hope you are having a wonderful day! I love all of your looks, Jenny! You looked so beautiful, especially looks #2 & #6. Thank you for stopping by. If you haven't done so please link up with me at http://mamainheels.com/2013/06/30/the-collective-social-blog-hop-co-hosting/ to meet new friends and grow your blog. Thank you Janise! I will definitely take a look at your blog hop. Great! Thanks for stopping by. Jenny - you are absolutely gorgeous and have such a great sense of style. I love all of these looks, it's hard to pick a favorite! Love it ALL. Just fabulous! Love all the looks, but especially the maxi you wore to the indie showcase! Great outfits - love #2 & #5. #2 you look like a Greek grecian goddess! Have a great week!! I love the dresses you saw wore at nos. 1 and 5! Loving that bright yellow on you!